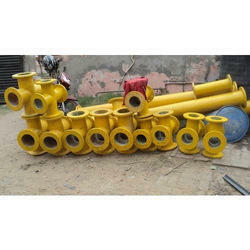 Manufacturer of a wide range of products which include frp cross fitting. As an acclaimed enterprise of the industry, we are offering a broad range of Frp Cross Fitting. These cross fittings are lightweight and strong options that are also safe & easy to install as well as provides superior insulation, thus safeguarding from bird age issues. Our cross fitting is designed and developed as per defined industry specifications including REC specifications and are mostly used in sugar mills. Looking for FRP Cross Fitting ?